Whee, UNDERCURRENTS is here again, to make February seem a whole lot less bleak and cold, at least for a couple of glorious weeks, stuffed to the bursting with Theatre from all across this ridiculously spread-out nation of ours. I’m just home from the second night of the 2014 festival (missed opening night due to rehearsals for my own upcoming show, which I THINK is a valid excuse), where I caught two great shows indeed. I’m gonna post about the second one first, because it’s only in town for this first week of the fest and I want to get the word out on how wonderful it is toot sweet, you dig? Don’t worry, the other review of the evening will follow soon. The show in question is BROKEN, courtesy of Ramshackle Theatre, a gang based in the Yukon, earning them the title of farthest travelling Undercurrent artists to date. A one-manner starring Brian Fidler, and directed by Maiko Bae Yamamoto (who was in the 2012 Undercurrents in the delightfully drunk WEETUBE 5400), this is, I kind of expect, the most intimate, honest and personal piece of theatre we’ll see at this year’s festival. A living love letter to the past, as told by William (Fidler) using a handful of objects that belonged to his grandfather. His grandad, see, was a wartime photographer, mildly famed for one particular picture that became a Time magazine cover. Back in the 1980′ s Granddad, at the age of 78, moved into the basement of the house owned by his son and his wife, and ten-year old William. Young Will delights in listening to Grampa’s meticulously catalogued stories and watching his slideshows…Grampa’s methods of holding on to his memories even as they begin to slowly slip away from his mind. 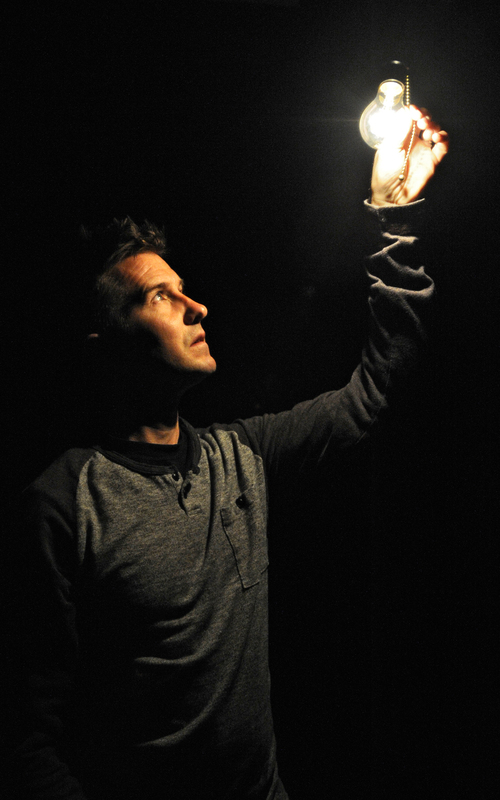 Brian Fidler in BROKEN from Ramshackle Theatre.